In OneNote for Windows 10, you can choose the color and thickness of new and existing ink strokes when drawing or handwriting notes. On the Draw tab, click or tap the Pen or Highlighter that you want to use, click the downward-facing arrow that appears next to your selection, and then select your preferred ink color. Tip: If the color you want isn’t shown in the palette, click More Colors. 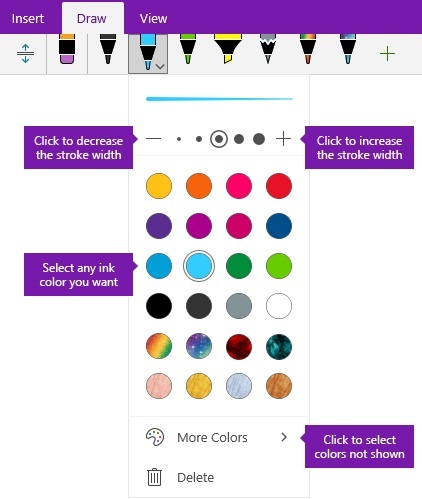 Click or tap the + symbol as often as you want to increase the pen or highlighter thickness. Click or tap the – symbol as often as you want to decrease the pen or highlighter thickness. Draw or handwrite your notes on the screen. Tip: To change the pen or highlighter color or thickness at any time while drawing or writing notes, repeat steps 1 and 2 as needed. If you want to change the color or thickness of ink strokes that you have already drawn, you can easily make adjustments. On the Draw tab, click the Lasso Select tool to select any existing ink stroke (or strokes) whose color or thickness you want to adjust. Click to select your preferred ink color.